Find free things to do at your destination! No matter what the destination is, travel is a wonderful experience. It’s a chance to see the world outside of your own backyard, have fun, relax, create memories with family and friends, and experience new people, foods, and ways of life. Unfortunately, too often when we’re trying to save money, travel gets the ax because it seems too expensive. Being both budget conscious and a lover of travel, I found it doesn’t have to drain your bank account. Many places have totally free things you can do. For example, you can visit Chicago and find plenty of free entertainment. US News listed Chicago as one of the 7 Best Alternative Spring Break Destinations. The large fountain spouts 1.5 million gallons of water. Although beautiful all day, the fountain really dazzles at night with a light display behind the fountain. Buckingham Fountain; Columbus Drive (301 East) and Congress Parkway (500 South); open mid-April to mid-October; Hours: 8 a.m. to 11 p.m. Admission to the pier is completely free. The 50 acre pier is filled with parks, gardens, and shops and located on gorgeous Lake Michigan. From Memorial Day through Labor Day, you can view a free firework display Wednesday and Saturday nights. With more than fifteen exhibits and animal houses, time will fly when you visit Lincoln Park Zoo. The zoo also features a children’s zoo and a farm. The zoo is totally free everyday of the year. The museum located in Chicago’s Lincoln Park neighborhood is filled with paintings, drawings, and photography. There’s also various events and performances offered throughout the year. DePaul Art Museum; 935 W. Fullerton; Monday through Thursday 11 a.m. – 5 p.m., Friday 11 a.m. – 7 p.m., and Saturday and Sunday 12 p.m. – 5 p.m.
Millennium Park is 24.5 acres of trails and sculptures including the popular interactive Crown Fountain. There’s concerts held periodically as well as family activities and plenty of room to picnic. 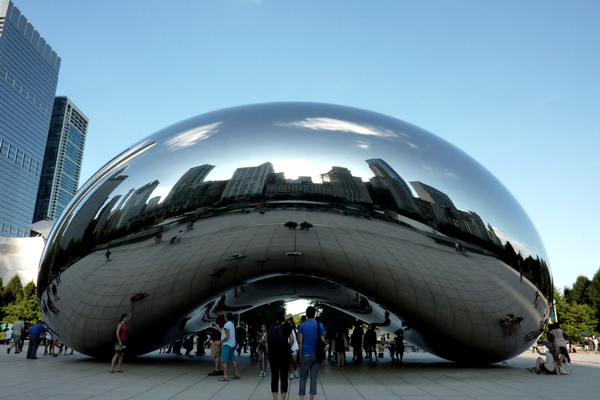 You’ll find the Bean at Millennium Park for a great photo opportunity. Millennium Park; Michigan Ave to the west, Columbus Drive to the east, Randolph Street to the north, and Monroe Drive to the south; Open daily 6 a.m. – 11 p.m.
Just north of Chicago in suburban Glencoe, is the colorful Chicago Botanic Gardens. Here you’ll find large variety of plants and flowers and of course, admission is free. If you are planning a summer visit, the Chicago Park District hosts Movies in the Parks all summer long. They play all different kinds of movies on a large screen at various parks across the city. Bring a picnic blanket or lawn chairs for a free movie. The Smart Museum has various art works in collections, publications, and exhibitions, and best of all, admission won’t cost you a dime. Smart Museum of Art; 5550 S. Greenwood Avenue; Hours Tuesday through Sunday 10 a.m. – 5 p.m.
All of the museums in Chicago offer free days throughout the year or a designated free time each week. Museums that would usually cost you upwards of $25 each person, are free. 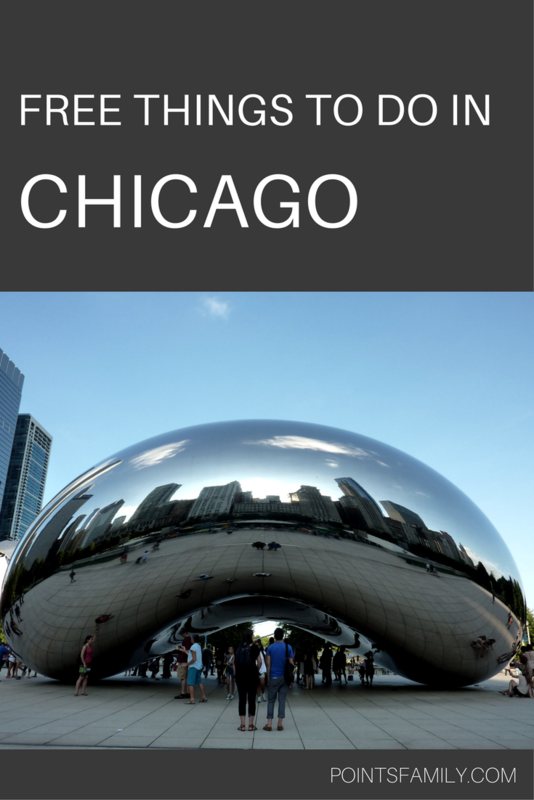 Some of the museums include Shedd Aquarium, Adler Planetarium, Art Institute of Chicago, Museum of Science and Industry, Chicago History Museum, Chicago Children’s Museum, and more. Each museum will detail their free and discounted admission days. One of the best parts about Chicago is the eclectic range of festivals. The only thing better than the large variety is that many of the festivals are completely free. There are fests to celebrate every race and ethnicity, food festivals including the city’s famous Taste of Chicago, art fairs, music, and many more. Having a bustling city on the coast of Lake Michigan has its rewards, and besides a gorgeous view, one of them is the numerous beaches. Whether you’re looking to picnic with your family, start a game of beach volleyball, or relax with a book, there’s a beach for you. For inspiration, see 15 Frugal Ways to Enjoy the Beach. There are also many dog beaches where your furry friend is free to frolic in the water. Even if your travels are taking you to another city, you can use this list as an idea of the types of places to look for free things to do on your vacation. What other free things can you do on vacation? I love Chicago! (well mostly when the the weather is nice!). I haven’t been there in quite some time though. I need to get back there.